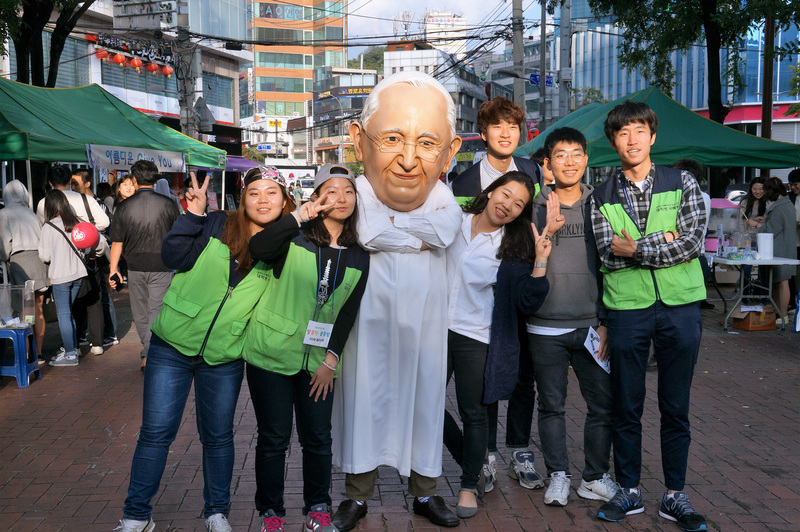 As a real practice of street evangelization, the Seoul Federation of Catholic Students (SFCS) hosted the 2nd PAX Festival on Oct. 8 at Sinchon—one of the most vibrant neighborhoods in Seoul where many young people gather. The festival featured a line-up of activity booths, traditional folk music and singing performance by the SFCS student members. A staff member wore the mask of Pope Francis as the event mascot and caught the eyes of many passers-by. The whole program began at 1 p.m. and concluded at 6 p.m. with a Holy Mass celebrated outdoors. Keeping the Holy Father’s words in mind, the SFCS initiated the PAX Festival in 2015 under the theme “Young people, wake up! 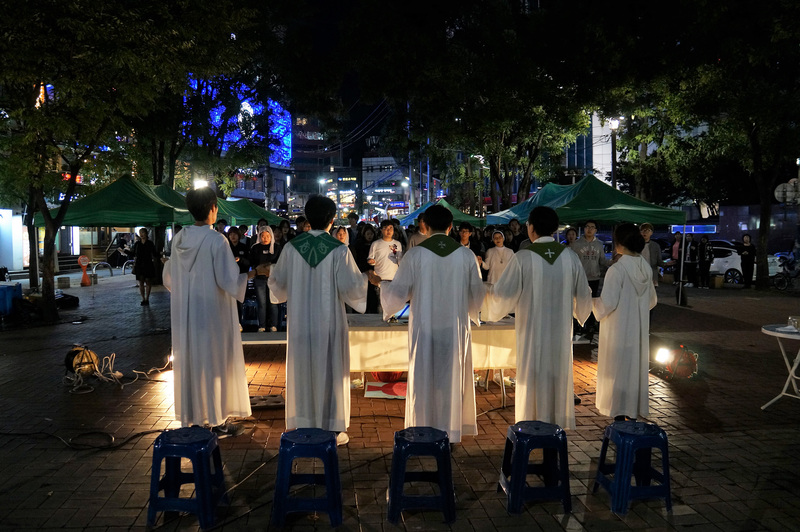 No one who sleeps can dance.” The event is designed to bring together Catholic university students for street evangelization: it isn’t held near a church, but on the streets of urban Seoul. “Through this kind of public event, we hope to encourage our student members to feel proud of their Catholic faith instead of trying to hide it,” said Clara Oh Yu-jung, the president the SFCS, a sophomore at Sookmyong Woman’s University. “Sometime we feel embarrassed to reveal our Catholic identity in public. We try not to do the sign of cross before having a meal in a restaurant. 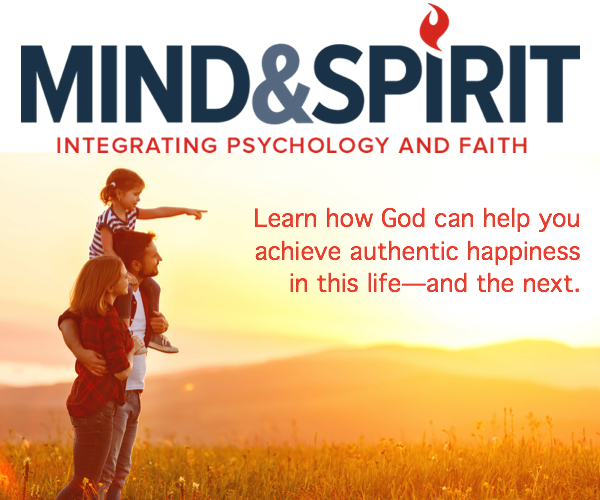 The purpose of the PAX Festival is to encourage young people to go out and interact with people outside the Church, to have the courage to become the witnesses of God,” she said. An unforgettable event occurred when a man saw the Pope Francis mask, he did the Sign of Cross, only in the wrong order. Fr. Peter Choi Bong-yong, the instructor of the SFCS, said that PAX Festival is a way for the students to bring the message of Jesus to the outside world. The Catholic student movement began in Korea in 1954 when the Korean Catholic Student Association was established. In the same year, the association became a member of Pax Romana, the international federation of Catholic university students and graduates. SFCS has about 1,200 student members from 36 universities around Seoul— every Sunday, members of the same school gather for Holy Mass together; during summer vacation, they go to countryside and participate in farming experience programs in real working farm.